The 1st American Cookie Lady is based on a fascinating mystery. 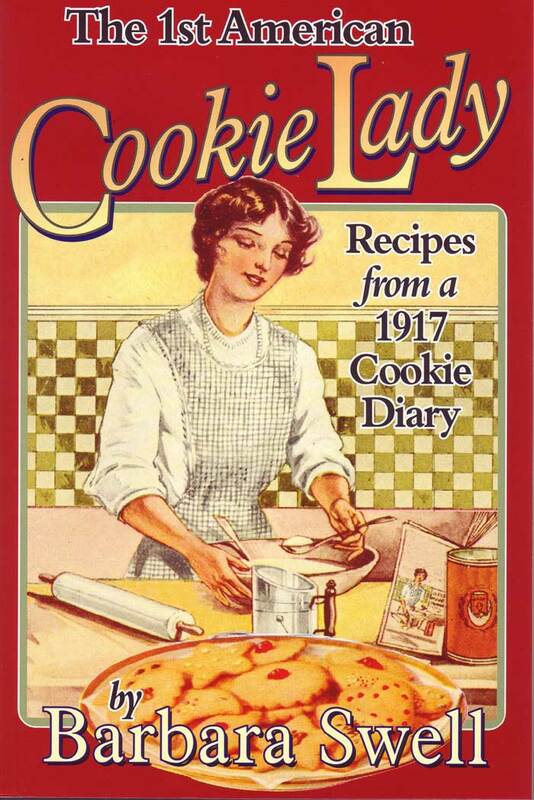 In 1917, Anna “Cookie” Covington set out to record all her favorite cookie recipes as a gift to her daughter because no published cookie recipe books existed at that time. Strangely, her 76 page handwritten personal cooking diary was never delivered to her daughter as planned. 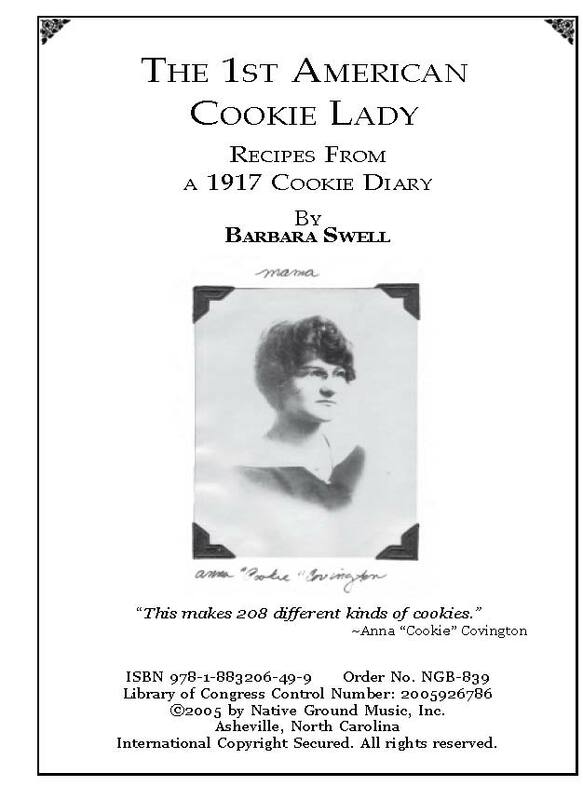 88 years later, the unused diary fell into the hands of food historian Barbara Swell, who recognized it as perhaps the earliest collection of American cookie recipes, dating from the mid 1880s up through World War I. The 1st American Cookie Lady includes Anna’s 221 recipes recorded from 1917-1920 along with adaptations for the modern kitchen, vintage graphics and photos, World War I food shortage recipes, plus curiosities of cookie baking history. 6″ x 9″, 152 pages. Recipes: Sugar Cookies, Best, Blitz Kitchen, Cookies, Cream Cookies, Plain Dew Drops, Drop, Eggless, Fairy, Fancy, Irene’s Light, Lady Fingers, Lemon, Mother’s Orange, Plain, Quick, Rock Royal, Sand Tart, Shingles, Shrewsbury Cakes, Snickerdoodles, Soft, Sour Cream, Sour Milk, Sponge, Sugar, Thin Rich, Shortbreads, Cocoanut, Scottish Petticoat Tails, Shortbread Varieties, Molasses Cookies, Brown Cookies, Chewy Molasses, Drop Molasses, Cinnamon Drops, Gingerbread Folks, Jungle Drops, Mama Drop, Maple Molasses Ice Box, Molasses, Roxbury Drops, Spice Cake Drops, Wine Drops, Ginger Cookies, Ginger Cookies, Ginger Drops, Ginger Snaps, Iced Ginger Cookies, Laughing or Fun Nuts, Sour Milk Ginger, Filled Cookies, Filled, Fig, Fig Bars, Filled Cookies, Rum Raisin , Peek-A-Boo, Fruit Cookies, Applesauce, Armon, Boston, Currant, Edenkobers, Fruit Bars, Drop, Hazel Hermits, Not Baked Fruit, Pepper-Kobers, Prune Rhubarb Rock, Chocolate Cookies, Brownies, Boston Brownie, Chocolate, Chocolate Nut, Cocoa, Pinwheel Cookies, Chocolate Orange, Marble, Mocha, Ribbon, Whole Wheat Cookies, Bran, Graham, Peanut Butter Grahams, Cornmeal Cookies, Colonial, Corn Meal, Corn Meal Hermits, Oatmeal Cookies, Brandied Raisin Drops, Filled Oatmeal, Gridly Oatmeal Oatcakes, Rolled Oat Rocks, Sour Cherry Amaretto, Coconut Cookies, Cocoanut Balls, Cocoanut Cream, Cocoanut Jumbles, Cocoanut and Oat Meal, Macaroons & Kisses, Almond Macaroons, Cocoanut Kisses, Hickory Nut Kisses, Peanut Cookies, Bermuda Peanut Wafer, One Egg Peanut, Peanut Butter, Peanut Snaps, Other Nuts Cookies, Almond Spoonie, Nut Bars, Nut Jumbles, Walnut Drops, Wafers, Benne Seed Wafers, Brandy Snaps, Oatmeal Lace, Interesting Flavors , Anise, Caraway, Carrot Marmalade Cookies, Castor Oil Cookies, Cigarettes Cookies, Coffee, Delicious, Rhubarb, Spencer, Swiss, Springerle Tea Cakes, WWI Cookies, Barley and Rolled Oat, Fancy, Honey, Mashed Potato Cookies, Nut Crisps, Oatmeal Macaroons, Rhubarb Marmalade, Rice, Rolled Oat Crisps, Rye Drop Cakes, Shorts Cookies Plain, Toasted Wheat Germ, War Cookies. An excellent dessert cookbook filled with recipes that survive the test of time with flying colors. I love the history in this book! Just beautiful. I also like that you “fixed” some of the recipes to fit modern taste buds. Thank you for preserving these recipes for the sake of the beauty of times gone by; sometimes I wish we were back there again. My husband and i lead worship at our church and others as well. He plays mainly acoustic for services, but loves to play banjo, mandolin, bass, drums, pedal steel guitar and doesn’t often get the opp. When I saw the name of your website I knew there was a banjo involved! Thank you for all the beautiful books in cooking and music. God sure made wonderful things in those two life hobbies. I was hoping to find/buy a copy of the original manuscript. for the Posey & Rivero Clan. SelectAll Books All eBooks All Recordings Individual MP3s Cookbooks Songbooks Instructional	Banjo Fiddle Mandolin Guitar Dulcimer Ukulele Old-Time & Bluegrass Civil War Gospel & Christmas Frontier Trailblazers Pioneers Railroad Nature Other Merchandise On Sale! Check out our full list of upcoming classes! Native Ground © 2019. All Rights Reserved.